(February 2015) – During the past year, the Boston Global Forum (BGF) held a series of online international conferences led by Governor Michael Dukakis and Professor Joseph Nye to address the problem of peace and security in the Pacific. The conferences focused on the tensions between China, the Philippines, Vietnam and Japan over claims to the South and East China seas. Conference participants included leading officials, scholars and policy analysts such as former Australia Prime Minister Kevin Rudd, Professor Ezra Vogel, President of Club de Madrid Vaira Vike-Freiberga, Robert Kaplan, David Sangers, Deputy Assistant Secretary of U.S. Department of State Bureau of East Asian and Pacific Affairs Michael Fuchs, and many others who have studied, written, lectured and published on the issue. The report on the issue is officially released in February 2015, which identifies three major aspects: (1) Threats to Peace and Security in the Pacific; (2) Principles for creating Peace and Security in the Pacific; and (3) Policies to promote Peace and Security in the Pacific. This report is derived from Boston Global Forum (BGF) conferences. A range of views, some conflicting, were expressed by conference participants. Accordingly, the viewpoints expressed in this report are those of BGF and should not be attributed to individual participants. 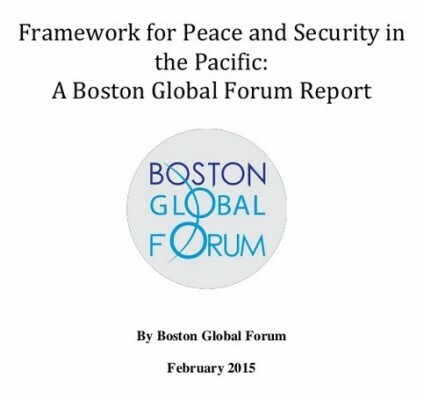 During the past year, the Boston Global Forum (BGF) held a series of online international conferences to address the problem of peace and security in the Pacific. The conferences focused on the tensions between China, the Philippines, Vietnam and Japan over claims to the South and East China seas. Conference participants included leading officials, scholars and policy analysts who have studied, written, lectured and published on the issue. A list of conference participants is appended to this report. Since the 1980s, the Pacific area has been peaceful compared to the previous decades, which were marked by the Vietnam wars (1946-1975) and the Korean War (1950-1953). In the past few years, these waters have been a flashpoint. China’s economy is heavily dependent on exports, and Beijing sees control of sea lanes as a key to continuing growth. China’s aggressive claims to territory in the East and South China Seas also have a larger geopolitical goal—reducing U.S. influence in the region. The United States has largely used its influence to promote democracy, human rights, open seas, and market economies in Asia—objectives that are at odds with China’s strategic regional objectives. China has largely used its influence to secure control of natural resources and assert influence over the internal politics of its weaker neighbors. Despite President Obama’s “pivot to Asia,” China appears to see the United States in a retreat from Asia, illustrated by it loss of military basing rights in the Philippines, resulting in the closing of Clark Air Force Base in 1991 and Subic Bay Naval Base in 1992. Although the Seventh Fleet subsequently moved to Singapore, its base there is less close to China. China has used its air and naval forces and even large militarized fishing boats to encroach upon and threaten its neighbors over shoals, islands, undersea oil fields, and fishing grounds. 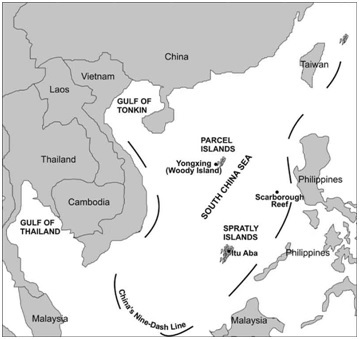 China claims these possessions as within its historical “nine-dash line,”which traverses the maritime territory of Japan, Vietnam, the Philippines, Brunei and Malaysia. In 2012, China sent marine surveillance ships to surround Scarborough Shoal, 123 miles from the strategic port of Subic Bay and within Philippines’s 200-mile exclusive economic zone (EEZ). The Philippines sent naval boats to oppose the capture of Scarborough, but backed off to pursue a legal strategy instead. Three years later, China still controls Scarborough Shoal. In 2013, China used its air force to claim an Air Defense Zone (ADZ) over the seas recognized in international law as belonging to Japan. China announced that any aircraft in the zone would have to comply with ADZ composed of its regulations and restrictions, including a requirement that all flights through the region notify Chinese aeronautical authorities. Japan protested China’s actions, and the United States soon thereafter flew nuclear-capable bombers through the ADZ without notifying Beijing. The ADZ includes the Senkaku Islands, which Japan has controlled since 1895. China has contested Japan’s ownership of the island, a dispute that escalated when Tokyo’s governor announced he would use public money to purchase the uninhabited islands from their private Japanese owner. Although the islands are too small to support human life, Japan has argued that under the UN Convention on the Law of the Sea (UNCLOS), it should have an EEZ in the surrounding waters, which contain oil and gas reserves. Please click Here to read or download the whole report.